Introducing the latest version of our system performance application with a new method to optimize the performance and lifespan of SSDs. Our new O&O Defrag 22 Server and Workstation Editions are now available with some groundbreaking new features! Our new O&O Defrag 22 Server and Workstation Editions are designed for use in modern data centers. In addition to improving overall system performance, O&O Defrag 22 also optimizes the performance and durability of both hard drives and SSDs. Small and medium-sized businesses also benefit greatly from the new data center quality of O&O Defrag 22. Files are often stored in pieces (fragments) onto the disk or onto the file system. The size of the fragments depends on the cluster size of the respective file system (normally 4KB in NTFS). Let’s assume a block on our SSD is 128KB and a file (128KB) that is split into 32 fragments needs to be saved (you recall, each fragment will be 4KB large). In the worst-case scenario, this would then have to be saved on 32 different blocks. If this file had only one “fragment”, one single block would be enough. The problem then with writing such a fragmented file: The controller has to find 32 FREE blocks and, in the worst-case, delete them all. Then it must write to these 32 blocks as well – and this must happen every time a file is changed too! Due to the increasing use of SSDs in the server area, considerable savings can be achieved by extending the service life of SSDs. A positive side-effect of developing the defragmentation method SOLID has been found in tests on “classic” hard disks: it is O&O Defrag’s most resource and hardware-friendly defragmentation method ever, with optimal results, and sets the new standard for defragmentation. As we mention above, files are also fragmented on SSDs. Data is often distributed to more memory cells than would be necessary. By defragmenting an SSD using our new method SOLID, it is possible to reduce the number of cells used to store file parts down to significantly fewer. This ability to optimize and protect both disk types is a prerequisite for today’s data centers that handle mass data per second, and where downtime costs a significant amount of money. 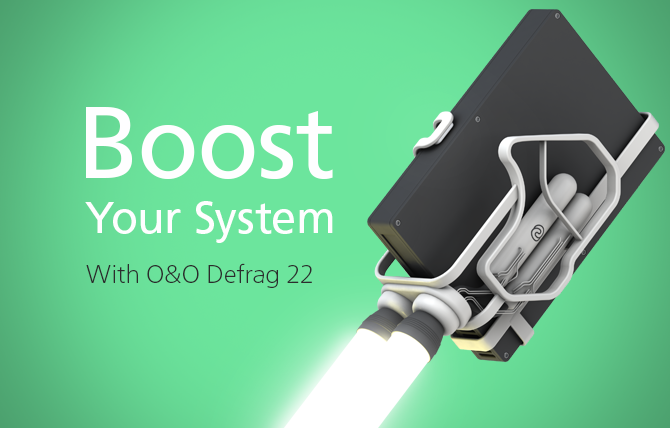 Let O&O Defrag 22 optimize your hard disks and SSDs, and you will get more speed while at the same time saving money on your hardware. Wie sieht es für SSD im Raid aus? Geht das immer noch nicht? Hallo Herr Neuber! Die SOLID Methode kann auf diesen Platten audgeführt werden, TRIM aber nicht. Unsere Entwickler prüfen dort die Möglichkeiten. Wenn sie sich positiv melden, werde ich Sie natürlich darüber informieren. Vielen Dank für die Ausführung. Was bedeutet das hinsichtlich der SSD Optimierung mit SOLID ohne TRIM-Befehl? Bringt das trotzdem Performancegewinne? Ja, definitiv – dieses Thema wird oben in Abschnitt 6 erläutert. Danke. Ich habe eben das Handbuch zur Version 22 studiert und dort steht bei Tipps und Tricks das eine Optimierung von SSD im RAID-Verbund nicht möglich ist. Was stimmt nun? einer Eingabeaufforderung als Administrator aus: Um eine Eingabeaufforderung als Administrator zu öffnen nutzen Sie bitte die Tastenkombination Windows-Taste + X und klicken dann auf “Eingabeaufforderung (Administrator)”. Die Zeile „IsTrimSupported“ gibt an, ob das Laufwerk / Controller TRIM unterstützt (1) oder nicht (0). Wenn der Controller es nicht unterstützt, dann gibt es für uns aktuell keine Möglichkeit, dieses Laufwerk mit TRIM zu bearbeiten.